A grandmother charged over an alleged garden stealing spree through the gardens of Brisbane&apos;s bay side has denied wrongdoing. But police are claiming she did not act alone. Sue Cochrane, 51, has been charged with 17 counts of stealing related to missing plants and garden ornaments. 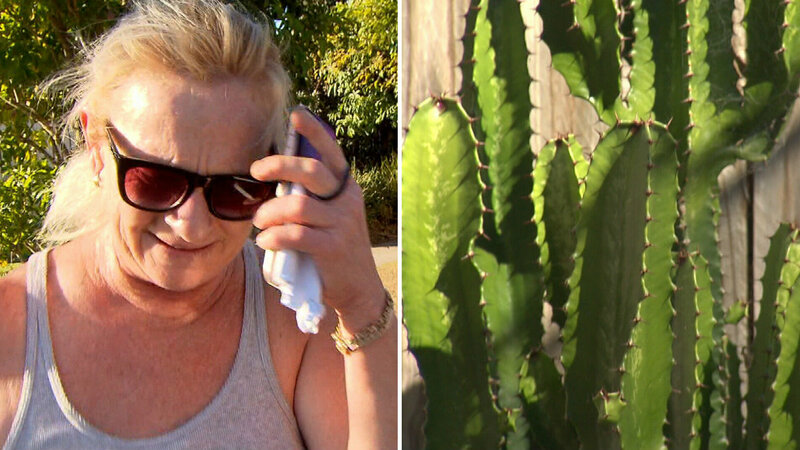 Among the plants that went missing in the alleged crime spree were two cacti belonging to a family whose five-year-old autistic son cared for as a relaxing hobby. "When we saw his reaction the first time we came home, it broke my heart," dad Dave Mitchell said. He said he was woken by a loud bang one morning to look out of his window and see a person jumping into a car and driving away with the two large cacti. "I had to drag them across the back yard to move them and that&apos;s pretty difficult, so I can only imagine what lifting them up into the back of a ute tray would be like. Another alleged victim, Janette Stanford, also had plants stolen, and said she managed to capture the image of a tall male with her security camera. Nearby resident Belinda had a water feature taken, while over the road Dianne Baker also lost plants. Police say they were simply able to follow a trail of dirt from one of the houses, which led to a home around the corner. Ms Cochrane, however, denied being the "cactus bandit". "Are you serious?" she said after being approached by A Current Affair. "How the hell could I lift a cactus, you fools?" However, police allege that she took a Buddha statue from a garden in Manly, garden pots from Wakerley and plants from Tingalpa. But they say her motivation was not to on-sell the plants or goods. "She&apos;s just a bit of a green thumb and likes to do her shopping in other people&apos;s gardens," Senior Constable Kass Eustace said. "I do believe she has at least one co-offender."